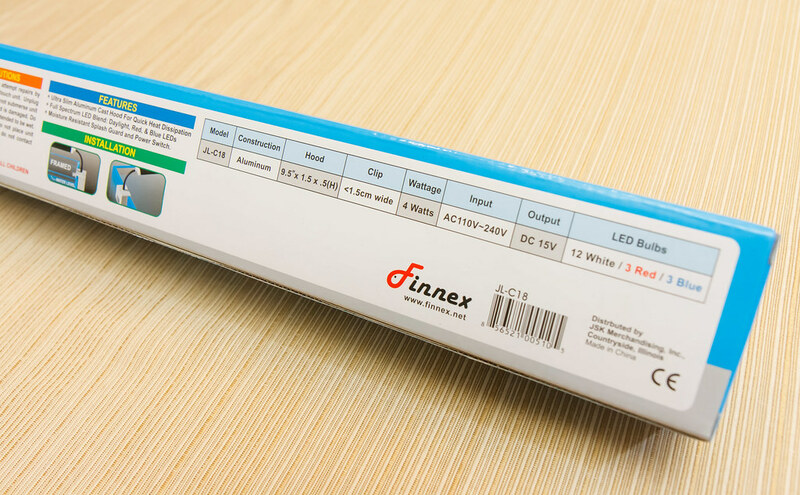 I have very much enjoyed the Finnex light fixture we placed on our Spec V aquarium and I searched Finnex’s lineup for a product that would work for our new Spec III tank. The Finnex Stingray Cliplight seemed the best option, so I got one to fit to our new tank. The Stingray fills a void in the Finnex lineup, providing light fixtures that are lower light intensity compared to other aquarium fixtures the company makes. 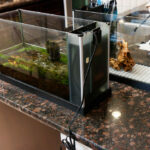 Finnex started with high powered models for marine and planted tanks, like the FugeRay. They then came out with a slightly lower powered model just for planted tanks called the Planted+ (the model that we use on the Spec V). Parallel to the Planted+ came the Planted+ 24/7 with more control of intensity and color. 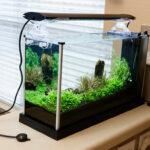 All of these models are perfect for aquariums that need high to medium light. Our setup of low light plants (without CO2 gas injection) is right on the edge between low and medium light; the Planted + works great. For many people, however, they do not have heavy planting, or have only slow growing plants that need only low light. Also, some people do not keep any plants, but are looking for a fixture that offers better (more) light than the fixture that came with their aquarium. For these people, a low light option was needed from Finnex, and that is what the Stingray lineup is for. 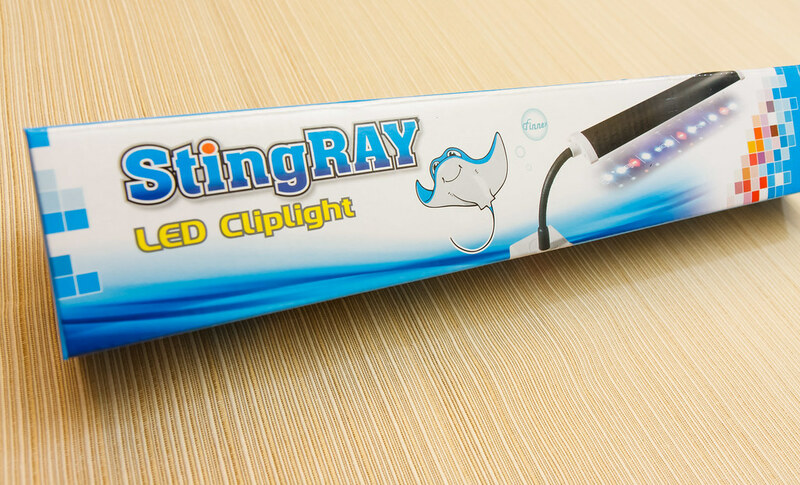 Stingray fixtures are also beneficial for those looking to get the technology of LED lamps and the efficiency that comes with them (compared to incandescent or flourescent lamps). The Finnex Stingray fixtures provide par values inline with low light aquariums. Stingray fixtures are available in a light bar configuration that can span the lenghth of aquariums in the following lengths: 16″, 20″, 24″, 30″, 36″, 48. Finnex also makes a clip-on model of Stingray for use on Nano aquariums; that will be the focus of this review. 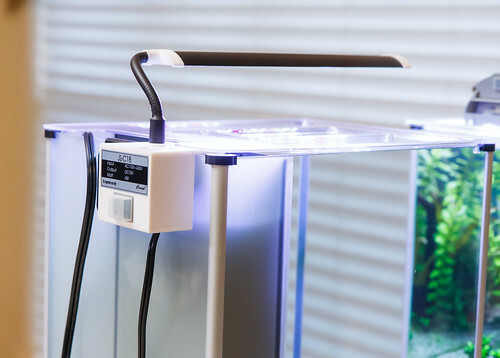 Finnex has made their Stingray Cliplight in a configuration made for smaller nano aquariums, although it seems it might be a bit longer than some of the competition. The light is configured as a light bar that is positioned with a flexible arm from an attachment point at the rim of the aquarium. 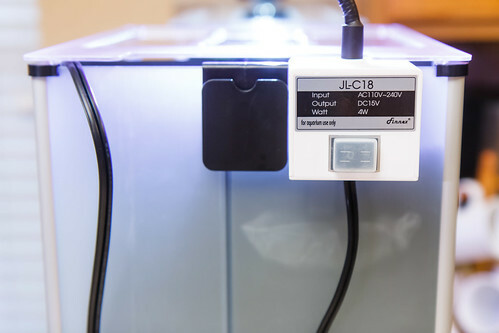 The ‘clip’ is a combination of clamp for connection to the edge of an aqarium, a power inverter to convert the AC power from the plug to DC power that the fixture needs, and the on/off switch. 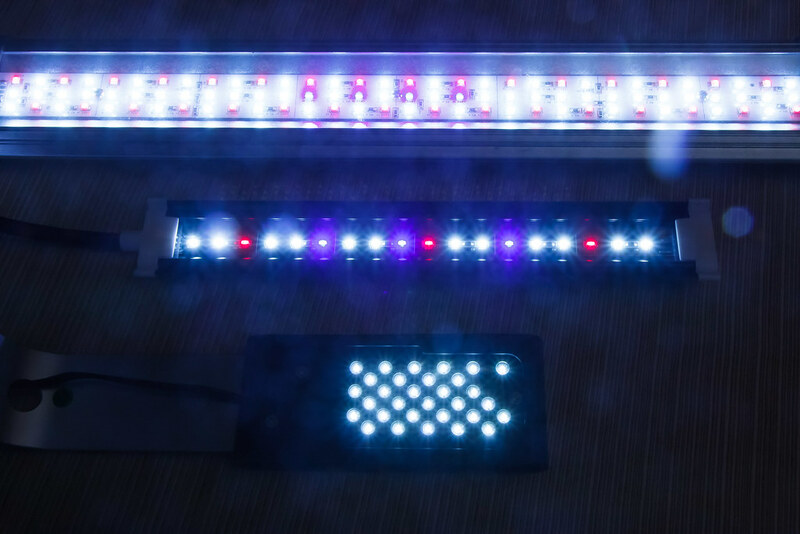 The light bar has an aluminum housing on top, plastic end caps, and a clear plastic cover on the bottom side to protect the LED’s from moisture. The Singray lineup has LED lamps of three different colors: 7,000k Daylight (white), Red 660nm, and actinic blue. For the Cliplight, (12) white, (3) red and (3) blue LED’s are provided. The specific type of red LED that Finnex provides (660nm) is the same type that is on the Planted + series. I can’t verify their claims that the red LED’s help the plants photosenthesize, but I do like the warmth that the red LED’s add. The use of Blue LED’s into the mix is interesting; I will have more to say about that later. 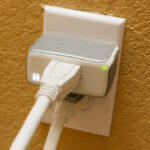 The listed power draw of the Cliplight is a very efficient 4 Watts. 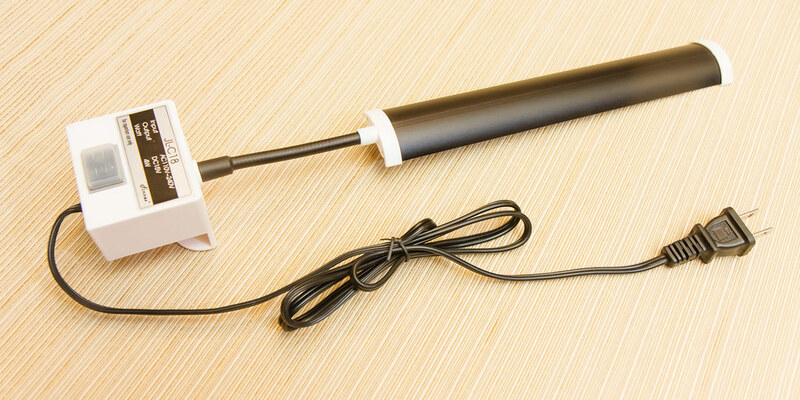 The power/clamp/switch unit is affixed to the aquarium glass with a clear plastic screw. It clamps on a rimless aquarium and it also works on aquariums with a plastic rim at the top; I tested it on a Petco 5 gallon model. 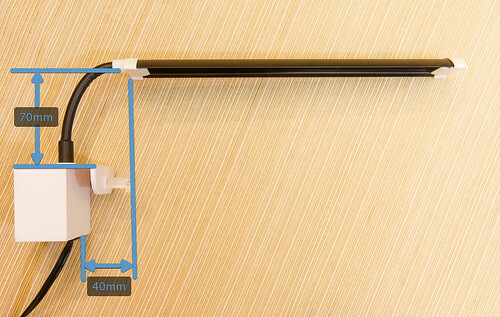 The maximum rim width that can fit inside the clamp of this light is 15 mm (0.6 inches). The switch is only on/off and is mounted behind a translucent rubber cover for water protection. The dimensions illustrated on the picture below show on average where the light is positioned relative to the glass edge. 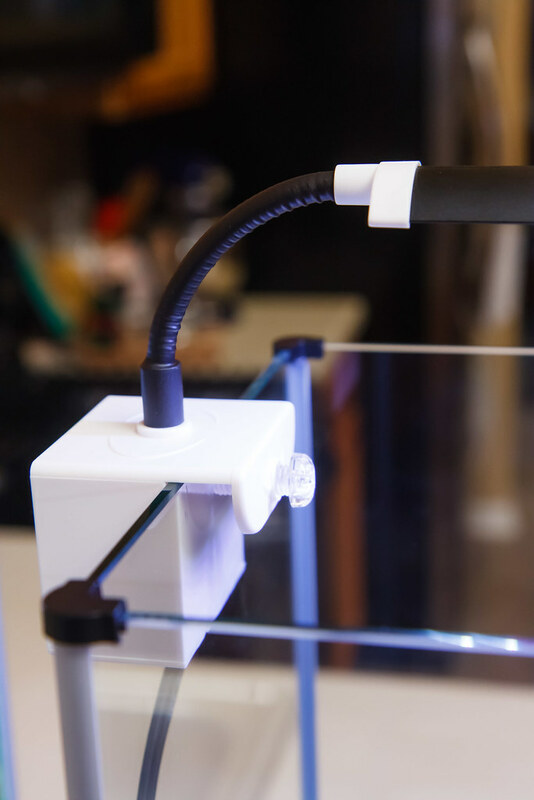 With a naural curve to the flexible arm, the light bar is positioned 70 mm (2.8 inches) above the glass and extends 40 mm (1.58 inches) from the outside edge of the glass to the near end of the light bar. See picture below (click to enlarge). Quality and design of the Finnex Stingray Cliplight is a mixed bag. Some things I’m very happy with, and other aspects of their design make me scratch my head. First, I will talk about the good. The construction of the light bar (the part at the end of the flexible arm, that is over the tank) is very good. The black anodized aluminum housing looks very high quality. The construction of the LED’s inside seems extremely tidy and well made. The flexible arm that you use to position the light bar over your aquarium is a bit on the stiff side. It made positioning a bit difficult. The light intensity is where I expected it to be and is perfect for the target buyer. It is not too bright as to cause excessive algae growth for a low light tank, but it is significantly brighter than most out of the box light fixtures. I think most people will be pleased with the light intensity from this lineup. Light is very even and pleasing. The pictures below compare light intensity of the Planted + (top), Stingray Cliplight (middle), and the stock light fixture from a Spec III (bottom). 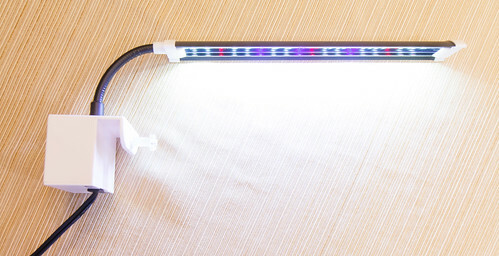 The light bar shape (long and skinny) lends well to mount on a conventional rectangular aquarium that has some length. 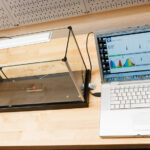 On a cube type aquarium with a square footprint, the light shape is not ideal. The only gripe I have against the lighting on this fixture is the resulting color. I prefer a light mixture that is more on the warm side. The light color of the Stingray, compared to the Planted + (which I feel has excellent color temperature) is cool, or to say another way, more on the side of blue than yellow. If I had a choice, I would have preferred this fixture do away with the actinic blue LED’s and replace with more white LED’s. This is a personal preference as I feel that lighting for freshwater aquariums looks better warm than cool. If you have a preference for neutral or cool light colors, then the Stingray lineup will be perfect. It would have been nice if the light controls could allow for separate switching of main/red and blue LED’s (similar to the Planted +). This would allow you to turn off the actinic blue LED’s if you don’t like the coolness. 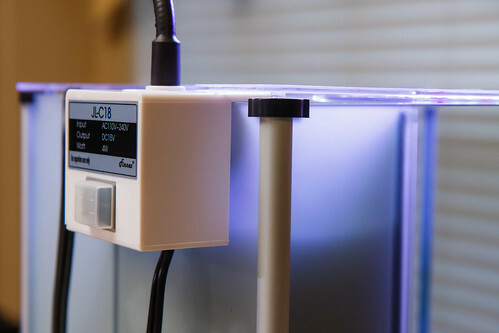 It would also allow you to turn off the main/red LED’s but turn on the actinic blue LED’s for a ‘nighttime’ setting. My biggest problem with the Stingray Cliplight is the clip/power/switch box. This contraption is all wrong. First of all, Finnex’s decision to put the power inverter here at the clip mount makes it very big and bulky. 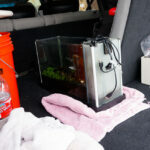 It is not sleek at all and does not fit the astetic of most planted nano aquariums, where attractiveness is a priority. The housing itself is klunky with noticable gaps in the construction. 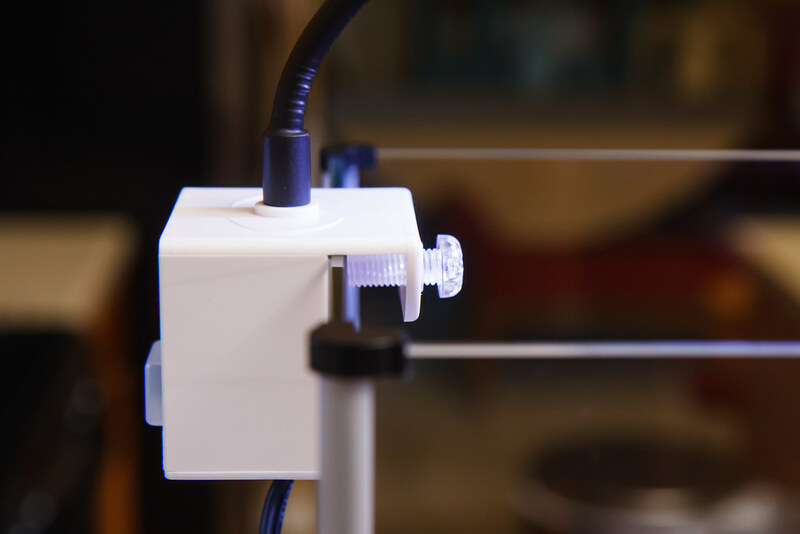 The ‘clip’ mechanisim is a simple plastic screw that presses into the glass. This fairly standard among aquarium light connections, but Finnex’s execution is not good as the screw is difficult to turn and doesn’t feel precise. 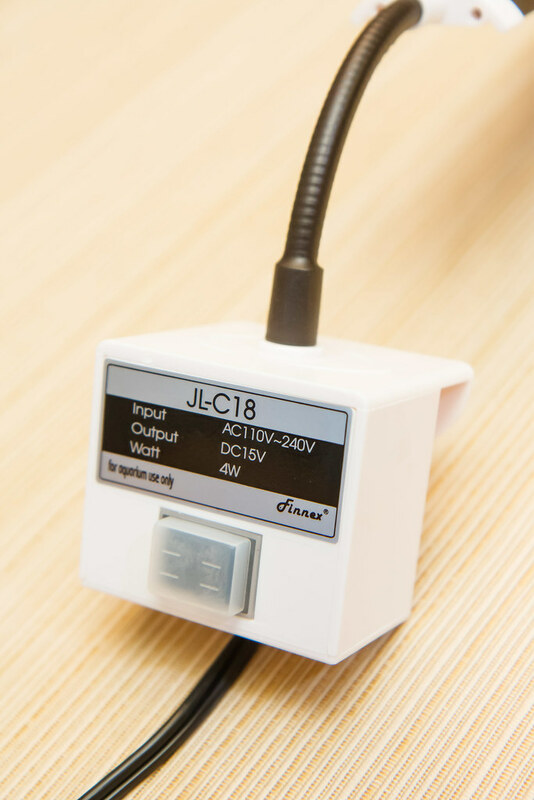 I know that many people do not like ‘power bricks’ but in this instance, Finnex should have had the power converter at the wall connection; this would allow the resulting clamp to be much smaller, only housing the switch. 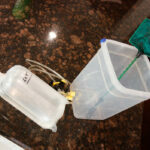 I had high hopes of this fixture working well on our new Spec III aquarium. It does work, but with some significant conflicts between the design of the Spec III and the Stingray Cliplight. 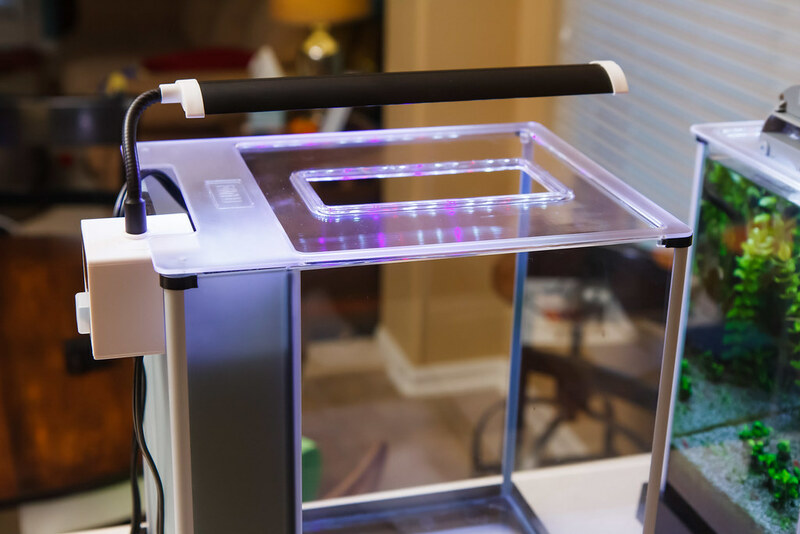 The acrylic top blocks much of the clamp surfaces, leaving only a portion exposed at the back (where the stock light mounts). The plastic mount that is glued in place for the stock light interferes with most light clamps. The divider between pump and filter sections block the clamp from sitting centered on the aquarium. The other issue is that the Cliplight is generally too long for a cube nano configuration like the Spec III. 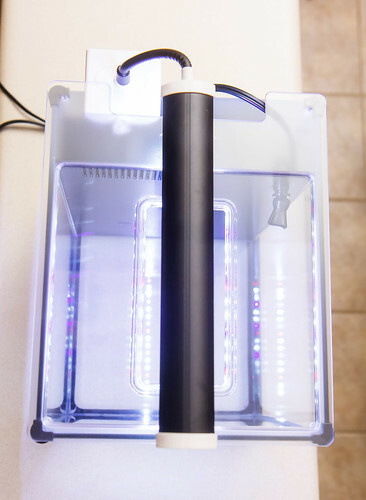 The light bar itself is the perfect length, but when you take into account the distance the flexible arm, it ends up protruding over the end of the aquarium. This is something that I could not gather from Finnex’s website and I hope my dimensions and illustrations provided above help. 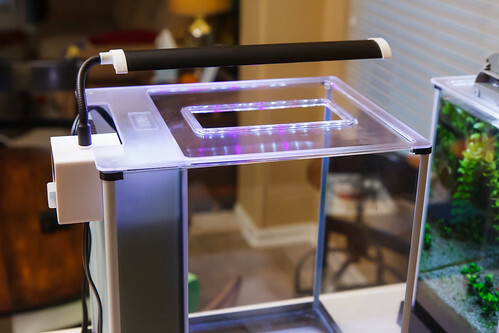 I delt with both issues (excessive length and mount location conflict) by mounting the light slightly offset, located partially under the acrylic top. I then, through great coersion and effort, twisted the flexible arm into a curved double arc to place it back in centerline above the tank. The result is slightly wierd, but it does work. The acrylic top sticks up just a bit with the clip/power/switch box below it. Even with the convoluted position of the flexible arm, the light tends to stick out just beyond the end of the aquarium. The result is passable. I don’t think it’s the best solution, but it is a good light and if you can be patient in getting it in this position it will work well. I honestly feel that the best aftermarket light solution for the Spec III will be a LED array that can be set on top of the acrylic lid (just like I do with a 16″ fixture on the Spec V). I’m still searching for a fixture like this. I am probably making too big of a deal about the clip/power/switch box. 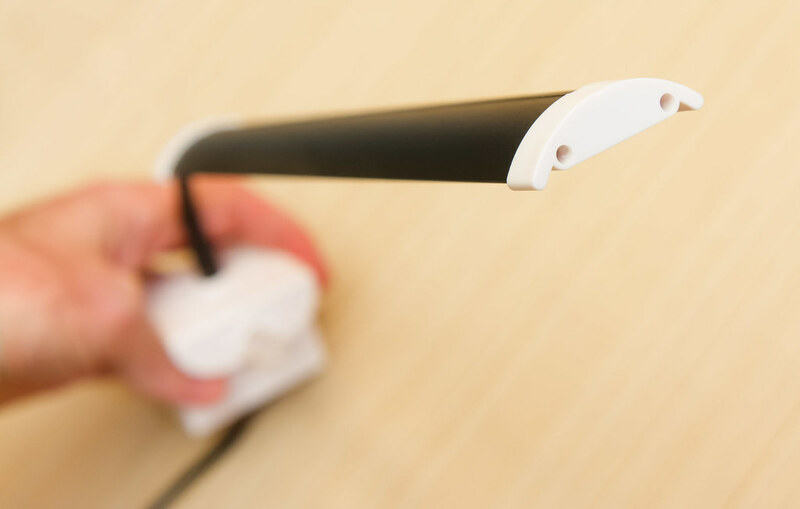 Many people would not notice or care, but I think it is a weakness in this product’s design and I hope they improve it or keep in mind for future products. 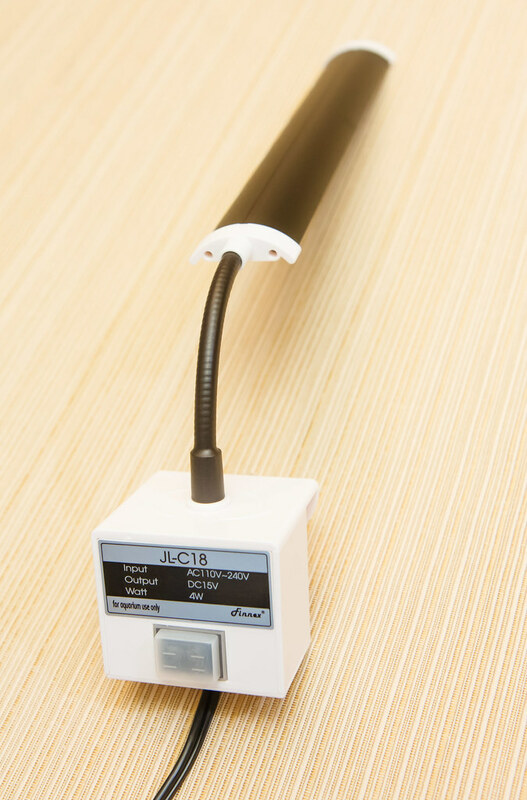 The light quality is excellent as far as brightness and uniformity. I love the construction of the light bar. I have a preference for a warmer light that has either no blue LED’s or accent LED’s that are less blue. Finnex also needs to step up their game and provide a warranty longer than 6 months. 1 year minimum is all I consider a true warranty. This limitation is for all of their products. Lots of my gripes are specific to the Cliplight. I think for those looking for a traditional configuration (16″ and longer) will be very happy with the Finnex Stingray. 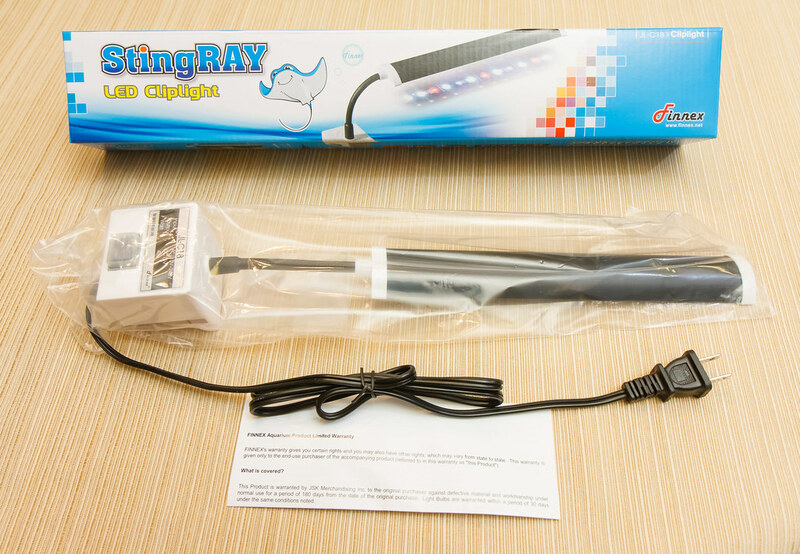 The Finnex Stingray Cliplight currently sells for around $25 USD on Amazon. 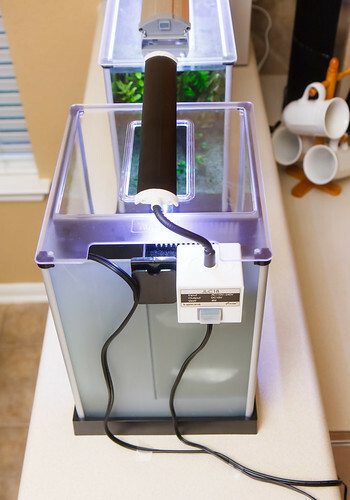 This entry was posted in Product Reviews and tagged aquarium, clip, cliplight, finnex, LED, light, nano, planted tank, Spec 3, spec iii, stingray. Bookmark the permalink. 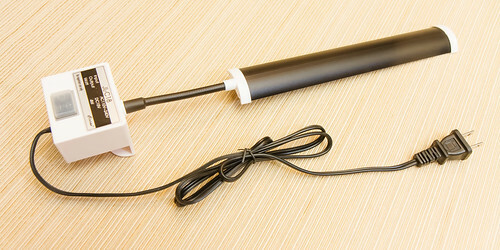 Very thorough review and great product photography with excellent details! It would’ve been nice to get some par data for this light since none is available online. Thanks for the review! Would it be high enough light to grow hc or a dwarf sag carpet? Not sure. If you did everything else right (adequate CO2, nutrients) it might grow to your liking.